Marni Senofonte, Beyoncé's stylist, collaborates with Mattel for some amazing Barbie dolls! The @Barbiestyle instagram account, one of the official Mattel accounts, posts photos and set ups featuring Barbie in a variety of roles and outfits, attracting a huge number of followers and exerting real social media influence. Many times, the dolls and outfits featured are one-of-a-kind creations, driving Barbie and fashion doll collectors crazy with envy, as they know they are never getting these dolls to own. The latest series of photos talked about online are from Mattel's collaboration with none other than Beyoncé's stylist extraordinaire, Marni Senofonte. As mentioned in her webpage, Marni Senofonte is a stylist, costume designer, and brand consultant. Her distinct style, which has evolved over the last two decades, layers proportion and pattern, texture and technique, high-end designer and fast fashion, to create iconic, trend defining look. Her work spans editorial spreads to appearances, music and films to world tours. Intensely collaborative, she enjoys teaming with designers, craftsmen and artisans to not only realize her vision and the vision of those she works with, but also to create outfits, imagery and full-realized brands that are both distinct and defining. She has worked with a wide range of celebrities and personalities, from Beyoncé, Lauryn Hill, and Sean Combs to Ciara, Mary J. Blige, and Jay Z, as well as with brands such as Gucci, Kenzo, Roberto Cavalli and couturiers Ulyana Sergeenko and Francesco Scognamiglio. Originally from a small town in Pennsylvania, Marni started her career as Norma Kamali's assistant. She now lives between Los Angeles and New York City. Like most people interested in fashion, Marni was playing with Barbie dolls as a kid, cutting their her, redressing and styling them. Like many kids out there, the doll was her first foray into fashion, unleashing her creative potential. 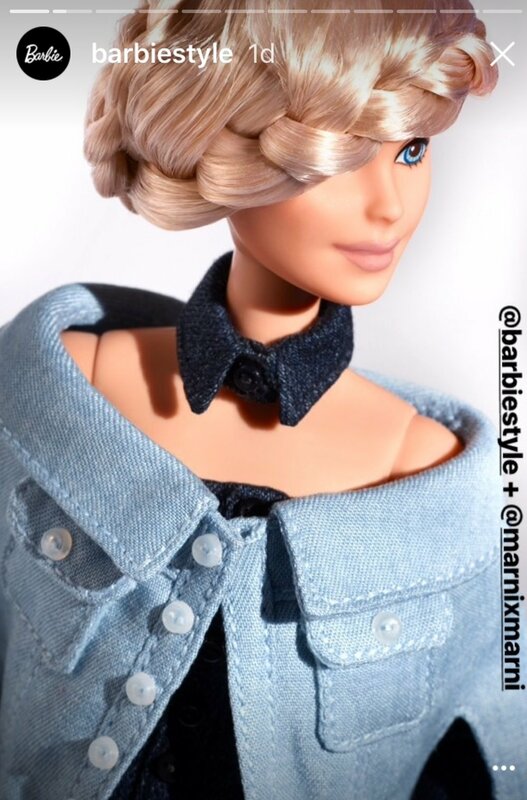 Coming full circle, her collaboration with @BarbieStyle features a range of one-of-kind looks showcasing a very diverse range of body, hair, and skin options. The stylist mentions that the Barbie Fashionistas line with their diverse body types (original, curvy, tall, and petite),skin tones and hairstyles, was her main inspiration. The dolls are not available for purchase. Hopefully we might see some of their style filter through in future releases of Barbie. Below are photos of the dolls from the @Barbiestyle instagram account and sketches of the dolls by Mattel designer Carlyle Nuera. The details and close ups are screen captures from @Barbiestyle instagram stories. All photos courtesy of Mattel.